Phoenix was ranked as one of the most polluted cities in the U.S. by the American Lung Association in 2014. A mixture of intense heat, sunlight, and traffic emission contributes to the high level of soot and smog in the air. Children, the elderly, and those suffering from asthma are particularly at risk for breathing problems. 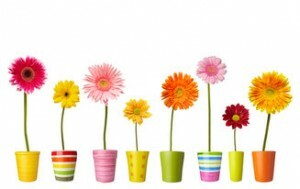 While proper cleaning and ventilation make up the bulk of clean-air strategy when it comes to residential households, household plants not only improve air quality but also add to your home’s aesthetics. Green is the color of calmness and rejuvenation. Having an extra dash of green in your home will brighten your mood as well as your air. Extremely easy to grow and incredibly versatile. This climbing vine can be planted in a hanging basket, a low planter, or even groomed into a topiary. English ivy is available in various colors and shapes. All it’s asking for is regular misting, especially during the winter. In exchange, it helps clearing out formaldehyde fume. Tip: I often put it next to my air humidifier and let the stream of extra moisture do the watering work for me. Bamboo has become synonymous to eco living. Its thin but hard stalk is the key material to many household products: from vegetable chopping board to queen-sized bed frame. Like English ivy, bamboo palm cleans up formaldehyde, plus benzene. It is also fairly low maintenance. 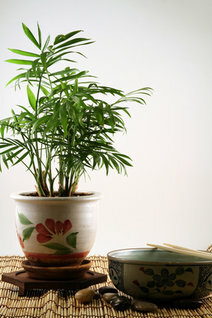 Water the palm regularly and place it near the windows for a couple hours of direct sun light per day. Add a little peace and harmony to your home with a pearly white lily. I find its shape to be reminiscent of the more elegant callas, and thus have always plant them in bundles. Peace lilies are toxic to cats and dogs, so avoid them if you have pets. The white bloom tops the NASA’s list for removing all three of most common VOCs — formaldehyde, benzene, and trichloroethylene. It also fights against toluene, xylene, and ammonia. Peace lily prefers shade over sunlight, making it an excellent plant for the bedroom or bathroom, so water your lily weekly and enjoy the bloom! My favorite. Another type of bloom that is particularly helpful at removing formaldehyde, benzene, and trichloroethylene (commonly found in dry cleaning). Unlike peace lily, Gerber daisy prefers lots of light. It is also available in a wide variety of colors: from red-orange to bright yellow to blushing pink. Gerber daisies are good gardening plants, but I find their bright colors really pop against white indoor walls. I always put them on my office desk, near the windows, and enjoy the rush of creativity and energy every time I look at them. Remember to remove the blooms as soon as they wilt. There’s nothing sadder than a wilted daisy. Known around the world by different names: Saint George’s sword in Brazil, tiger’s tail in Japan, or mother-in-law’s tongue in… well, let’s just move on. Its stiff, tapered leaves can be sharp, so it isn’t necessarily the best plant for households with small children. On the other hand, snake plant loves dark and steamy environment, making it an excellent bathroom plant. I like to have one near the toilet, to clear the air and absorb the chemical fumes after each bout of deep cleaning. A 2-year study from NASA listed more than 25 air-filtering plants. I’ve selected the best five in terms of air-purifying power, and I’ve also especially chosen them for homeowners who do not possess a green thumb (like me!). These are also the more common house plants that should be readily available at any home improvement and gardening store, in case you want to head over there right now and grab yourself some new potted greens.